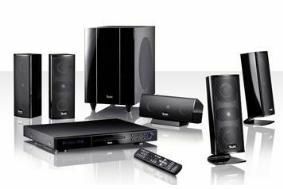 Teufel releases two new 5.1 DVD home cinema systems | What Hi-Fi? They may not offer Blu-ray playback but you can rest assured that Teufel will be doing its best to cram in value for money from the Impaq 4000 and Impaq 6000 5.1 systems. The IP 6000 'DVD-Prereceiver' is at the heart of both machines, comprising an upscaling DVD player, FM radio, decoding for Dolby and DTS soundtracks and amplification. Capable of playing MP3, WMA and DivX video as well as upscaling DVDs to 1080p. There are HDMI, component and composite video connections, plus digital optical and coaxial inputs for audio and a USB input for MP3 players. The key difference for the two packages is that the Impaq 4000 is a standmount system while the Impaq 6000 features floorstanding speakers and a slightly larger sub. Priced at £982 and £1250 respectively, head over to the impressively informative Teufel website to read all about the new systems.